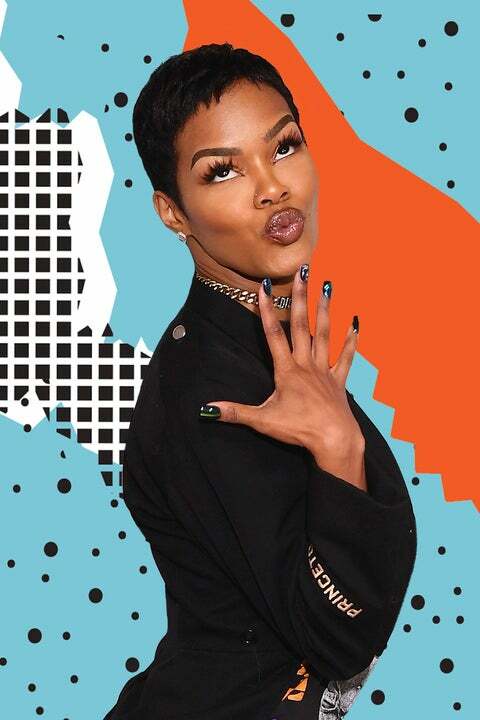 Teyana Taylor is pretty much your average twenty-six year old woman; she grew up idolizing Janet Jackson, like so many of us, is a beauty junkie (more on that later), and knows the best bodegas in Harlem. Except when you talk to her, you quickly realize she’s actually nothing like the average twenty-six year old. In addition to a very impressive resume that includes singer, dancer, and actress, the mother of one (baby Junie is absolutely the cutest!) is also everyone’s ab-spiration. It’s also apparent that while the forthcoming reality star loves a good beat, she’s also super comfortable in her own skin; and wants all women to feel the same way. We caught up with Teyana at KISS Products‘ first-ever pop-up Beauty Bar to chat beauty, and the first time she let Iman see her makeup free. “I asked Pharrell what do you do to keep your skin so fresh! Please tell me what you did I told him. And he said drink water and exfoliate, those are the keys! “The beauty products I absolutely cannot live without are my KISS Lashes, the couture style are my favorite, and Gel Fantasy Nails by KISS. “Oh girl, he saw me in my du-rag the first time I let him hit it — he seen it from jump! That’s why we fell in love, because it just is what it is.